The cranes are delivered special design for handling doors and cable drums. The cranes is delivered with size from 1 tons to 30 tons. 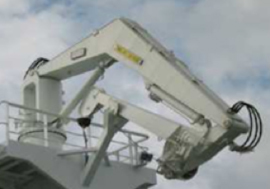 Telescopic cranes can be to be placed on gun or streamer deck for handling gunarray, floats and buoy handling. These cranes can be delivered with passive tension compensation and with active heave compensation to increase operation ability in harsh weather conditions.